Farmers who have to live with the reality of unpredictable rainfall are trying to cope as best as they can. They are experimenting with different crops to see what works. And each time they start new field trials, they incur debts. In Andhra Pradesh, where intense rainfall incidents are increasing, farmers are growing fruit orchards. In Chhattisgarh, where average rainfall is decreasing, farmers are growing pulses and sorghum that require less water. Adi Narayana, a farmer living in Mukundapuram village in Garladinne mandal of Anantapur district, used to grow millets and sorghum on his 1.4 ha farm. Twelve years ago he shifted to groundnut cultivation when the area began to receive above-normal rainfall over longer periods. Groundnut cultivation is rainfed and Narayana thought he would make some profits. Rainfall data shows Anantapur was getting 143 days of rainfall a year between 1991 and 2001 as against 98 days between 1961 and 1990. 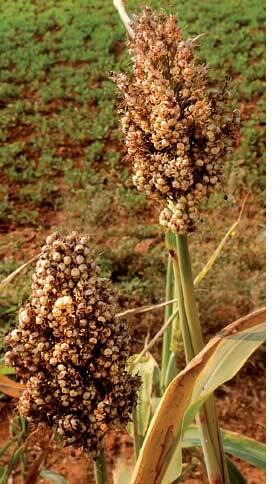 But severe droughts between 2001 and 2004 and frequent intense rains in the following years ruined his crops. He realized he was spending Rs 10,000 to grow a crop that earned him just Rs 5,000. He decided to reduce his risk and grow sweet lime that is not dependent on rains and is less labour intensive. He sunk a borewell to irrigate his fields. Like Narayana, other farmers in the district too started growing sweet lime trees after the intense rains in 2008 destroyed their groundnut crop. 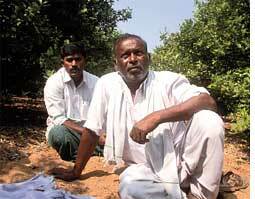 When Narayana sold the first sweet lime harvest in 2008, he earned Rs 50,000. "I took a loan of Rs 1 lakh four years ago when I decided to switch to sweet lime and have spent Rs 25,000 every year since on nurturing the trees. I now hope to pay off my debts and earn some profits," Narayana said. But there is one thing that is bothering him. The fruit trees need to be watered throughout the year and so are heavily dependent on groundwater for irrigation. In Marthadu village adjoining Mukundapuram, farmers had switched to fruit cultivation but it depleted the groundwater. As a result, four farmers who incurred heavy debts were driven to suicide between 2001 and 2003. One of them was Vamsi Krishna Reddy, 32, a rich landowner with 9.7 ha land who took loans to switch to fruit cultivation. 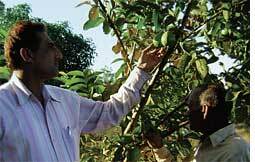 Narayana said growing sweet lime was his last resort to make farming profitable. "If the groundwater here depletes my family will perish," he said. Digging borewell has now become the only way to meet water needs in Anantapur. The minor irrigation department too is encouraging water- intensive agriculture by heavily subsidizing borewells. Non-profits said this would create more problems for farmers. G V Ramajaneyulu, the executive director of Centre for Sustainable Agriculture, Hyderabad, said cultivating crops that require less water and promoting traditional varieties of food crops would help agriculture in the global warming scenario. His organization is promoting sustainable and organic farming in Andhra Pradesh. Mohammad Salim Rokaria, a farmer in Banbagoid village in Dhamtari district of Chhattisgarh, is already feeling the pinch of groundwater depletion. He converted his 4.5ha farm into fruit orchards eight years ago. "In the beginning there was water at a depth of 160 feet. In the last eight years I had to insert 20 feet pipes twice into the borewell as the water table has plummeted," said Rokaria. "Dhamtari is irrigated with water from Gangrel dam of the Mahanadi. But this year the rainfall was so low that nobody got water for irrigation," he said. R P S Tyagi, the district collector, said there were hardly any rains: "We could not do anything." Some farmers in the neighbouring Mahasamund district are shifting from rice to pulses that require less water to tide over the hard times. Between 1999 and 2008, land under rice cultivation decreased from 241,000 ha to 224,000 ha and area under pulse cultivation increased from 15,000 ha to 22,000 ha in Mahasamund, according to Indira Gandhi Agricultural University in Raipur. "Mahasamund is a rainfed district and is drying up. Earlier, high total rainfall led farmers to cultivate several varieties of rice. But now this place is becoming semi-arid and we are encouraging farmers to grow pulses and sorghum that require less water," said A S R A S Shastri, director (research) at the University. Rainfall in Mahasamund has decreased from 1,800 mm in 1906 to 800 mm in 2000. But many farmers are not going by the university's recommendations. Some of them in Mahasamund subdivision said soil in their region was sandy and therefore not fit to grow pulses. Kisan Parmar, the up-sarpanch of Ghorari village in Mahasamund, said, "People here are continuing to grow rice though yield has decreased." He said pulse cultivation has been more successful in Pithora and Saripali subdivisions where soil is heavy and can hold water. Civil society groups do not agree with the government policy of shifting from rice to pulses. They said it will affect food security. Janaswasth Sahyog, a non-profit, recommends rice intensification--a system of natural farming that does not require flooding the paddy fields. "With the system of rice intensification, rice can be grown in Chhattisgarh with less annual rainfall," said Jacob Nellithanam who is working with the non-profit and specializes in rice genetic resources. In Chhattisgarh, rainfall was always unpredictable but has become more so of late, say agriculturists. Seventy-year-old Jagmohan Sahu of Malidi village in Khaiwarepara taluka said the area would receive continuous rainfall for two weeks at a stretch when he was young. "Now rains occur in short, intense spells," he said. "I used to make rain caps out of straw during the rainy season. I have stopped that now as it is not needed," said Sahu. He decided not to switch to pulses and still grows rice and sesame on his one-acre plot though his yield has gone down. The Indian Council for Agricultural Research that is studying the impact of climate change on agriculture is yet to come out with solutions that will help farmers sustain themselves. In the absence of sound advice they are using trial and error method.